The development of miniaturized systems for chemical and biochemical analysis has grown to the point where lab-on-a-chip devices are now important enabling tools in a diverse array of application areas. As the size of these systems continues to shrink, details of the micro- and nanoscale phenomena associated with their construction and operation must be considered. 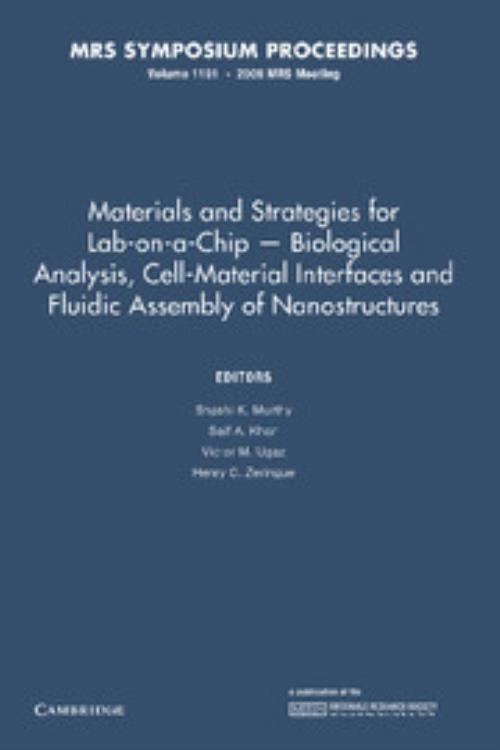 This book focuses on materials and engineering aspects of lab-on-a-chip devices and the application of microfluidics to materials synthesis. A microfabricated fluidic system integrating biological sample treatment and detection on a single chip offers the promise of low-cost, rapid and high-performance analysis. These devices can perform high-throughput biochemical assays for drug discovery and provide portability for point-of-care diagnostics and biothreat monitoring. Topics include: frontiers in lab-on-a-chip research; materials for lab-on-a-chip; materials synthesis on chip; cell manipulation and biomimetics on chip; porous materials in lab-on-a-chip; sensing and detection on chip - molecular level; sensing and detecting on chip - cells and particles; and sensing and detection on chip - DNA. Sashi K. Murthy Northeastern University, Boston. Saif A. Khan National University of Singapore. Victor M. Ugaz Texas A & M University. Henry C. Zeringue University of Pittsburgh.